newdynamics Publications is a voice for women and men of diverse races, cultures, and callings who experience life as a creative journey. -from the Leadership of the NTL Institute for Applied Behavioral Science. • how the diverse voices of members are inevitably brought into the room. • Our publications empower people to engage in a co-creative process. • Our publications were developed over more than 40 years of consulting with major multinational companies, and educational, human service, and religious institutions. • Our widely recognized diversity journey models guide individuals away from behaviors that promote the traditional roles of dominance and subordination, to new ways of relating that value partnership and diversity. 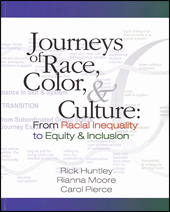 newdynamics Publications invites you to read our unique and widely-used books on valuing equity, inclusion & diversity.